Get the jump on the all things dinosaur in anticipation of Universal’s new movie, Jurassic World, scheduled to open in June of 2015 by visiting the Adventure Aquarium’s new limited time exhibit, Dinosaurs of the Deep. Enormous prehistoric marine reptiles that ruled the primeval seas more than 100 million years ago are taking over Adventure Aquarium on the Camden Waterfront starting January 16, 2015. For a limited time only, five thousand square feet of large-scale skeletons, ancient fossils and more than 20 life-size replicas will be on display throughout the aquarium to teach guests about the most intriguing sea monsters that ever existed – from massive pliosaurs and prehistoric armored fish to the whales, sharks and turtles that inhabit our oceans today. Come face-to-face with life-sized replicas of some of the most ferocious and feared species that ever lived, including a 42-foot Elasmosaurus, 20-foot Kronosaurus, 21-foot Zygorhiza, 16-foot Dunkleosteus. Meet the 34-foot full scale Liopleurodon, one of the ancient oceans’ most dangerous predators, whose teeth were 4-inches long. The larger-than-life exhibit will also feature a replica fossil of a Tylosaur still stuck in stone and a life-sized coral reef teeming with trilobites and prehistoric fish. Interactive dioramas and educational stations situated throughout the aquarium help guests learn about the enthralling world of ancient aquatic life through hands-on exploration. Along the way, visitors get the chance to touch a horseshoe crab at the “Touch a Living Dinosaur” exhibit and become a paleontologist by examining fossils of a variety of shark species and the largest sea turtles that ever lived. Discover and learn more during your visit by taking in special programming. Check out some of the shows and talks available exclusively during Dinosaurs of the Deep. All live programs are included with general admission. Categories: Family Travel, New Jersey | Tags: Adventure Aquarium, Camden Waterfront, Dinosaurs, Dinosaurs of the Deep, Dunkleosteus, Elasmosaurus, Family Travel, Jurassic Waters, Jurassic World, Jurassic World Trailer, Kids, Kronosaurus, Mid Atlantic Region, Mid Atlantic States, Mid Atlantic Travel, New Jersey, prehistoric marine reptiles, Sea Turtle, Zygorhiza | Permalink. Santa, like everyone, knows a good way to escape the summer heat. He’s heading to the Adventure Aquarium on the Camden, NJ waterfront. It may be hot outside, but inside Adventure Aquarium it’s like a winter wonderland under the sea. Enjoy the first-ever Christmas Celebration in July, a halfway-to-the-holidays festival that includes special dive appearances by the one and only Scuba Santa. Experience magical glowing trees, twinkling lights, and holiday-themed festivities. 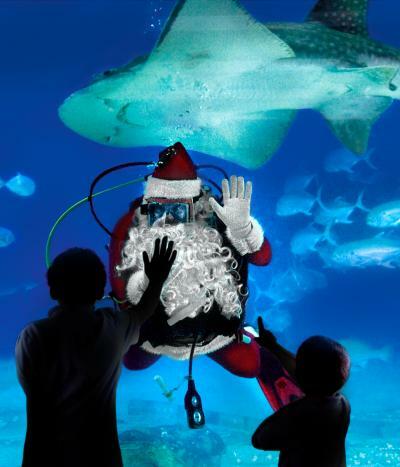 Scuba Santa will be flying his sleigh into town for the weekend; making daily dive appearances in the 760,000 gallon Ocean Realm – home to the country’s only great hammerhead shark on exhibit, massive sea turtles and more. And swing by the Rotunda to meet up with Bumble the Abominable Snow Monster, who will make it SNOW inside the Aquarium. All guests will receive $5-off coupons to come back to Adventure Aquarium for our annual holiday celebrations in December. FREE PHOTO OPPORTUNITY: Get a 5×7 photo when you take a photo “underwater” with Scuba Santa through Green Screen Magic. FREE with any package purchase from H20 Photo. A $12.99 value, and the perfect opportunity to get a head-start on your family holiday photo! Categories: Children's Travel, Family Travel, New Jersey | Tags: Adventure Aquarium, Christmas in July, Christmas in July Adventure Aquarium, Christmas in July New Jersey, Family Travel, Kids, Mid Atlantic Region, Mid Atlantic States, Mid Atlantic Travel, New Jersey, New Jersey Aquarium, Santa at Adventure Aquarium, Scuba Santa | Permalink. Hidden deep below the surface of the ocean is a vast world filled with some of the most unusual creatures on Earth. Get up close to many of them in the Adventure Aquarium’s Jules Verne Gallery. Named after the celebrated authored of Twenty Thousand Leagues Under the Sea, the Jules Verne Gallery features an impressive collection of exhibits that highlight strange and fascinating creatures of the deep. Enter Jules Verne to encounter magical creatures like Pacific Sea Nettles and Moon Jellies, or learn why Weedy Sea Dragons are described as one of the most elaborately camouflaged creatures on the Planet. And come face to face with a Giant Pacific Octopus, known for its intelligence. In fact, these invertebrates are so smart, they can complete puzzles and problem-solve for food. And if all of that wasn’t enough, Jules Verne provides a stunning view into our 550,000-gallon Shark Realm Exhibit, which houses the largest collection of sharks on the East Coast. Best of all, you have the chance to get up close to “Randolph,” the brightly hued Giant Pacific Octopus. Discover the amazing and bizarre creatures found deep below the oceans’ surface in the magical underwater world that is the Jules Verne Gallery. Categories: Family Travel, New Jersey | Tags: Adventure Aquarium, Aquariums, Kids, Mid Atlantic Region, Mid Atlantic States, Mid Atlantic Travel, New Jersey | Permalink. 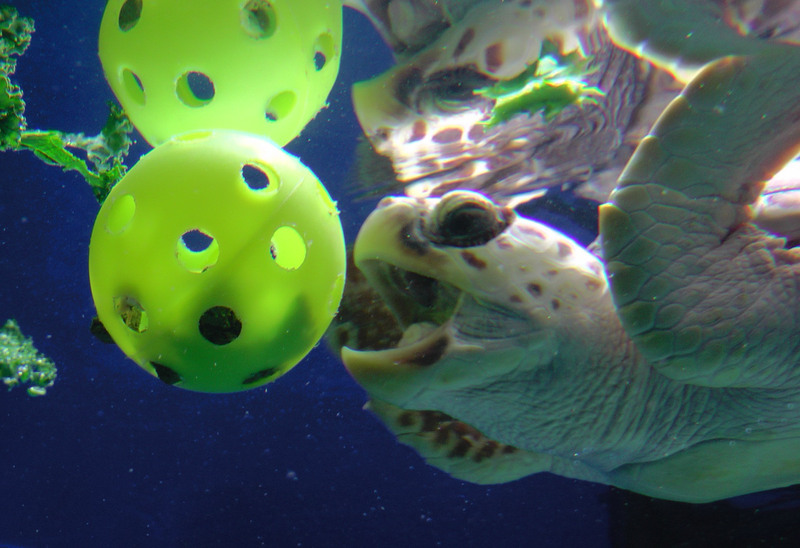 Tortuga’s recent enrichment includes learning to hunt and forage, using a whiffle ball stuffed with food. Calling all ocean lovers! Celebrate World Oceans Day June 7 & 8 at Adventure Aquarium. There will be an array of hands-on interactive activities, demonstrations from conservation partners, up-close aquatic animal opportunities, free live shows and so much more. Learn what you and your family can do to protect marine life locally and worldwide. Behind-the-Scenes Tours: Journey to the top of our 760,000 gallon Ocean Realm exhibit to get a birds-eye view of the massive sea turtles, Great Hammerhead shark and more. All for a good cause: 100% of the proceeds from the tour will go to benefit New Jersey’s own Marine Mammal Stranding Center. Times: 12:00, 12:45, 1:30, 3:00 and 3:45 Cost $5. Space is limited – first come/first serve. Head to the Information Desk to sign up. Live Talks: Hear from special guest speaker and New Jersey native Bruckner Chase, an ocean enthusiast who is also an endurance waterman who will talk about his experiences from waters around the world; learn about rescue and rehab loggerhead sea turtle “Tortuga” who will be making his return to the ocean this fall and hear from divers as they share their encounters with plastic pollution in the wild. FREE with admission. Check Visitor Guide for full details upon arrival. Interactive Activities and Crafts: Get hands-on to learn about sea turtles, plastic pollution, horseshoe crabs, sustainable seafood and more. Plus, representatives from the New Jersey Academy of Aquatic Sciences, Marine Mammal Stranding Center, Surfrider Foundation, and Whole Foods will be on hand to showcase things everyone can do to positively impact sealife. FREE with admission. Check Visitor Guide for full details upon arrival. Categories: Green Travel, New Jersey | Tags: Adventure Aquarium, Family Travel, Kids, Mid Atlantic Region, Mid Atlantic States, Mid Atlantic Travel, New Jersey, Shark Exhibit, Turtle Exhibit, World Oceans Day 2014 | Permalink.